Some art work has come and gone. Some was never meant to last more than a few days or a summer. A number of public artworks have been removed,�stolen or vandalised. This page tells the holds on to the memories of this 'lost art'. 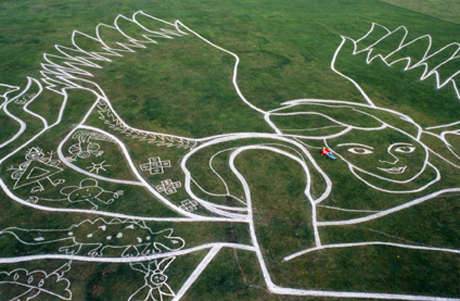 The Angel of the Lee Valley was temporary land art work etched across Leyton Marsh. The large chalk drawing of an angel was a collaboration with local groups and included people of seven different faiths of the local community including Kreative Kids Klub, African Caribbean Welfare Association, Muslim Women’s Welfare Association, HEBA Women’s Project, North London Deaf Children’s Association and Leyton Sixth Form College. Read the full "Hackney Citizen' article. More. 'Fully working, life-size bouncy castle in the shape of Stonehenge. The work was installed at Lee Valley Waterworks Centre in August 2012; 'the final date of its London tour'. Artist: Andrew Dwyer, in association with Freeform Arts Trust. The installation �marked the end of the �Lea Bridge Gateway Partnership's Single Regeneration Budget �programme.�designed to create a positive local identity for semi-industrial area in the Lea Valley. Visit Andrew Dwyers site to see how the installation once looked. Bulrush has since been reinstalled over a mile from Walthamstow Marsh on Ruckolt Road, at the gateway to the Olympic Park. If there are no plans to fill the gap left by this art installation on Lea Bridge Road, perhaps the money should be reimbursed, or spent on some other aspect of the regeneration of the Lea Bridge Gateway? Three sided ping pong table. Pop up installation at the disused North Millfields paddling pool by the Redundant Architects Recreation Association (RARA). Disassembled and removed within a few days or installation. Artists: MM Hudson and Andrea Sinclair of Art in the Park worked with the Asian Family Group; Bamcroft Primary School and Elmtree Woodcraft Folk to create a set of four bronzes sited along Coppermill Lane. The themes of the bronzes are; the marshes and their wildlife; the copper mill; the river Lea and its boats; the reservoirs and birdlife. Four bronze sculptures placed along Coppermill Lane as part of a Walthamstow Millennium project. Developed with local community groups and schools by Art in The Park. 2. Reservoirs and bird life produced by Bamcroft Primary school in 2000. 3. Marshes and their wildlife�(near Rensburg Road) produced by the Asian Family Group in 2000. 4. The two leaves gateway sculpture survives. The project was commissioned by Waltham Forest as part of the Waterways Festival programme being supported by a Millenium Festival Fund grant form the Heritage Lottery Fund, Bristish Waterways, London's Waterways Partnership and fifteen London Boroughs. Read the article on the theft of the last remaining sculpture below. ( please note that we have has no association with Walthamstow Guardian or its advertisers).